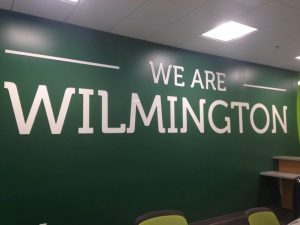 There are many outlets for people to express themselves through different classes and activities on Wilmington College’s campus, and music is an art that anyone can relate to in one way or another. The music department has much to offer for those who like to sing, play an instrument, or develop a greater appreciation for music. One such outlet is Wilmington College Chorale. 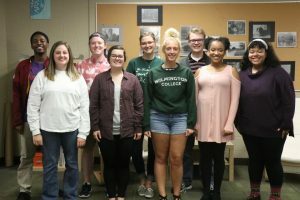 Chorale is a singing group that has been an important part of Wilmington College’s music department for many years, and prior to this year it was directed by WC’s Professor of Music Catherine Roma. Beginning in the 2013 school year, it has been directed by Tim Carpenter. Many different concerts are peformed by Chorale throughout the school year, including the Westheimer Peace Symposium and a Christmas concert. More is offered in the spring season of classes. Tim shares, “Right now the group is an all girls group, which is awesome. I’m in the process of picking out music [for Chorale].” There is still a chance to be part of this opportunity. Classes are offered Monday, Wednesdays, and Fridays from 4:10-5:40. It is a rewarding experience and a great way to make friends who enjoy singing as well. As a former Chorale student myself, the experience was a very enjoyable one. The choice of music was great for a small group of people, and I really got to connect with other students. Knowing that we all had singing in common and most of us had past choir and performance experience, it all came together very well. Tim is a positive director as well, always helping us improve as well as letting us know in which areas we are showing talent and progress. I have been in many choirs throughout my life, and this one was a fine experience. The most recent concert, which took place on January 19, was the Christmas concert, sung by the fall semester group of singers. It was a very successful performance, despite the small number of singers who were able to participate in Chorale. Because of the changes that have taken place, at a new time and with a new director, Chorale has been trying to start on a new foot, but its importance to the college continues on. Chorale has been a cornerstone of the performing arts department, and many students and teachers alike wish to see it grow. 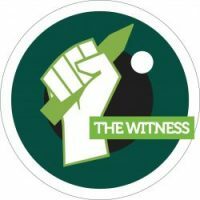 It is a class offered for credit or not for credit, and it is open to any interested in participating. Come be a part of this exciting musical opportunity! For more information, email carpenter_t@wilmington.edu. 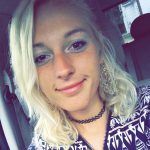 Maraya is a 2018 graduate who majored in Business Management and Political Science and minored in Spanish. She believes that writing is a wonderful way to communicate and express oneself to others.